Greg Hall surprised us with his fresh, innovative act in November of 2017. We’d never seen anybody quite like him. 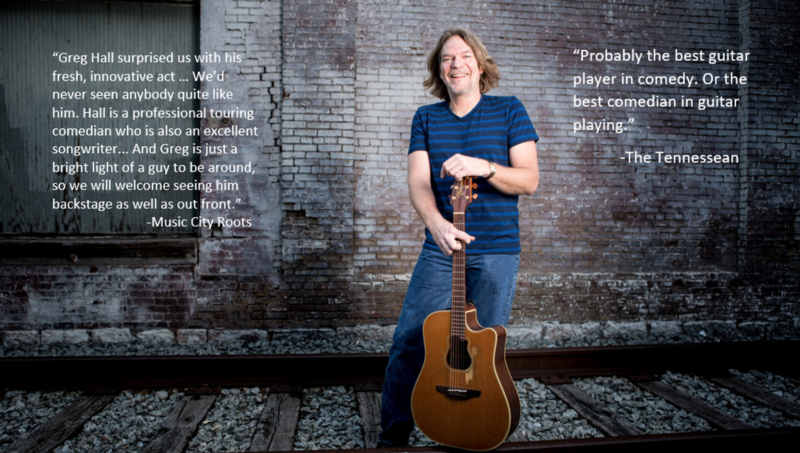 While we regularly hear folk singers with a comic rapport, Hall is a professional touring comedian who is also an excellent songwriter. In my review of the night, I wrote that he “was gracious, magnetic and very funny. You can’t quite tell if he’s doing a routine or just riffing, which is the sign of a true talent. The songs themselves mixed the lightweight and the inspirational, including the nice ‘Don’t Let Your Light Go Out.’” And Greg is just a bright light of a guy to be around, so we will welcome seeing him backstage as well as out front.